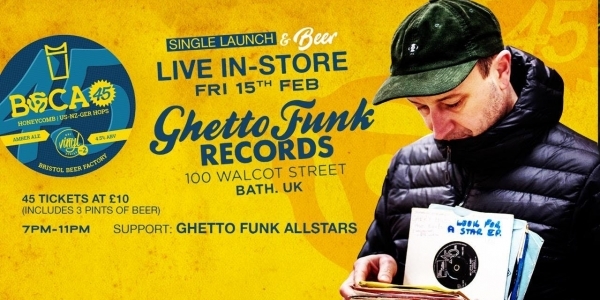 To celebrate his new single and launch of his own beer with Bristol Beer Factory, Boca 45 will be live at Ghetto Funk Records in Bath on Friday 15th Feb.
We will be open from 7pm till 11pm. Boca45 will be on the decks with support from our own Allstars. There is only 45 spaces available at £10 each. Each person will get 3 Pints of Boca45 Beer included in their ticket price. Don't worry if you're not a big beer drinker we will also have a cash bar serving spirits and shots.